School consolidation was a trend that developed in North Carolina immediately following World War I as state and local leaders sought to improve the quality of rural public schools. Parents of children in rural districts served by one- and two-teacher schools began to demand educational advantages more comparable to those in towns and cities. Leaders tried to accomplish this in many cases by consolidating several small districts into one, financed by a special school tax that a majority of voters in the respective districts imposed on themselves. People in rural communities often resisted efforts to close small neighborhood schools in exchange for larger and better-equipped facilities, however. Higher taxes, loss of local autonomy, and less personal rapport between students and teachers were among the leading reasons for opposition to school consolidation. In many instances, local taxes required to finance consolidated schools were defeated at the polls several times before winning voter approval. Proponents of the consolidation movement were successful in convincing voters of the benefits of home economics, agriculture, and other vocational courses not found in the smaller schools. Larger facilities also allowed rural communities to have high schools for the first time, as well as teachers with specialized training in academic subjects such as English, history, mathematics, science, and foreign languages. Moreover, larger schools meant more competitive athletic teams, which had an undeniable influence on school and community spirit. North Carolina's good roads were paramount to the success of consolidation, since students had to be bused several miles to larger facilities. The purchase and maintenance of school "trucks," and keeping a driver behind each steering wheel, became major expenses in school system budgets. There were still one- and two-teacher schools in half of North Carolina's counties as late as the 1960s, but the success of the consolidation movement of the 1920s is clear. In 1900 there were 7,166 schools in the state, serving a population of 1.9 million, with buildings and equipment valued at $1.7 million. By 1930, when North Carolina's population had reached 3.2 million, there were only 6,340 schools, with buildings and equipment valued at $110 million. 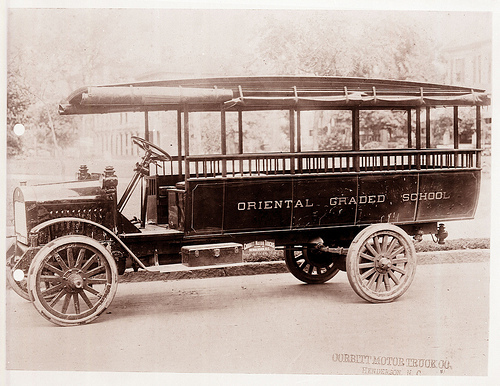 School bus made by the Corbitt Truck Company in Henderson, NC, for Oriental Graded School, Pamlico County, NC, c.1917. From the General Negative Collection, North Carolina State Archives, call #: N_80_3_57, Raleigh, NC. Available from http://www.flickr.com/photos/north-carolina-state-archives/4970916828/ (accessed September 14, 2012).